Valarie says: This map is based upon information about what would happen if all of the world’s ice sheets melted, flooding Seattle. We see that the Wedgwood neighborhood would survive! This map is based on real-world information–I created the Seattle sea levels from publicly-available LiDAR data, rendering the rise of the seas in 10-foot increments for the animation, starting at the current shoreline, and ending with the 240-foot level. 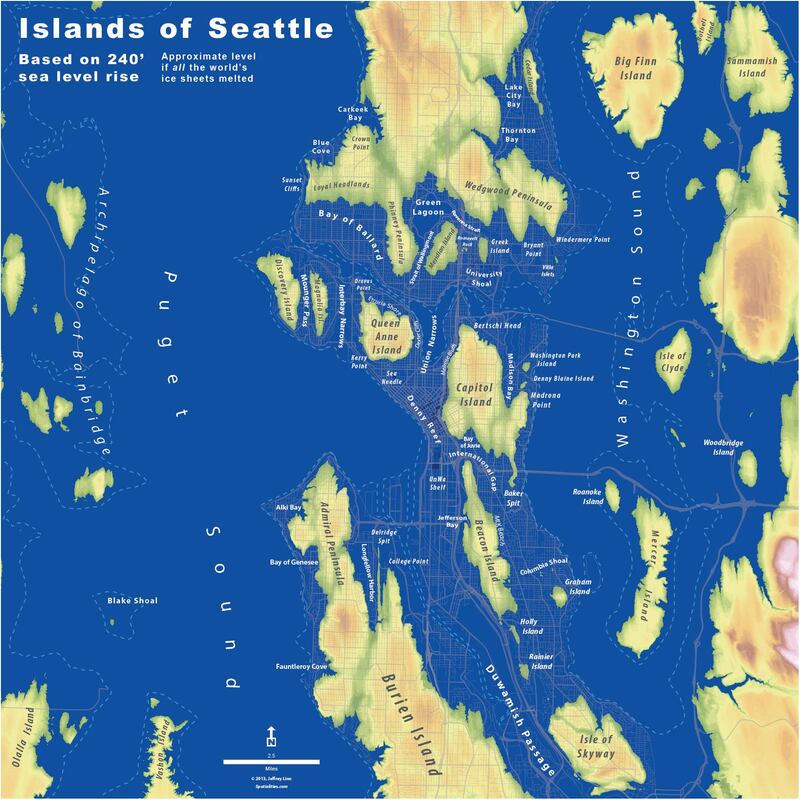 The Islands of Seattle poster was rendered at 240 feet of rise, which is roughly what would happen if all the world’s ice sheets melted. I don’t know how long it would take for this to happen. One estimate says roughly 5,000 years. If this is accurate, then our descendants living with this level of sea rise would look back on our time in the same way that we might look back on the Early Dynastic Period of Egypt. This entry was posted in Nature and wildlife and tagged geology, land forms. Bookmark the permalink. whoa!!!! Scary to think about!